Defined in the 19th century in France as, “the set of rules that define the art of good food,” gastronomy developed with thanks to Brillat-Savarin and his inimitable The Physiology of Taste: Or Meditations on Transcendental Gastronomy published in 1825. It’s the foundation of the science of culinary systems and it far exceeded anything that great recipe writers had written since the Renaissance. It’s based on the art of showing what we eat as a “proof” in the photographic sense of the term. 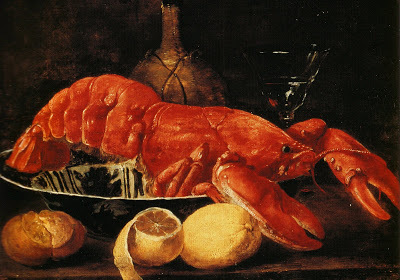 The majestic Lobster in a Porcelain Dish painted by Jan Fijt (Rotterdam, Boymans-Van Beuningen Museum) juxtaposes its red colour against the blue piece of porcelain, and recalls how much this shellfish is much more than a curiosity: it’s an attribute of inconstancy. Without reaching too far into the world of Flemish art, it is true that all gastronomies convey their own artistic messages, such as Japanese Food Art, presented as part of the path that leads to tastes and flavors. In this process, art may be seen as a cultural mediation of ingredients that gives infinite and well-respected creative power.